Classes just finished, right? I mean, did I miss something? Oh… yeah… the part about me adding French to my course load so I can get enough semesters in to hopefully get into a good Comparative Literature PhD program next year. Sigh. And you know what class means? Coffee. Actually, French isn’t too bad. I took it back in high school and I’m more interested in translation than conversation, so I’m not stressed at all about it. It should be an easy GPA boost. HOWEVER, my schedule is a bit wonky with scholarship apps (ahhh Fulbright, Marshall, Mitchell, and Bobby Jones… four apps…. ugh…), studying for the GRE, pulling together enough poetry for a good portfolio for MFA programs, reading Deleuze and Beckett for my thesis, and hopefully cracking Being and Time. Did I mention that I’m working part time for two different jobs too? This. This is why I need coffee. And coffee cake! I’m in love with Vegan Visitor. It’s true. I like the layout, the photography is gorgeous, and the recipes are tasty as hell. If hell were tasty–which I’m not sure it is… Anyways. After reading the post and recipe for the Also Goes With Tea Coffee Cake, I knew I needed to make it. Need is a rather open term for me, but it applies. I swear. After substituting pecans for walnuts, adding a bit of chocolate, baking in a bundt pan, dusting with powdered sugar–oh my gosh fingerlicking good. Unfortunately, I couldn’t get a good shot of the layering of the coffee cake. It was eaten a bit too quickly. Oops! The Poet gave it two thumbs, two big toes, and a happy belly up. Personally, I think it tastes like a doughnut, and then a cake, and then coffee cake–all at the same time. It goes great with coffee, tea, soy milk, after dinner, before dinner, whenever. I had to give half of it away. Otherwise I’d eat it all. In a period of two days. Summer–the perfect season for baking induced weight! Right? Toss the pecans, chocolate chips, brown sugar and cinnamon in a small bowl and set aside. Cream the sugar with the margarine, then add the baking powder and continue to mix until fluffy. In a measuring cup, combine the yogurt, soy milk and baking soda. Add half of the yogurt mixture to the creamed sugar, then half of the flour, mixing until each is combined, repeating with the remainder. Lightly spray and dust a bundt pan with flour. Add half of the cake batter to the pan. Add half of the walnut topping. Finish with the remaining batter, then evenly sprinkle over the last of the topping. Bake in the center of the oven for 45 – 50 minutes. Cool completely in the pan before turning it out to a serving plate. That cake looks like the PERFECT way to get your dose of caffeine – yum!! Hang in there with the courses!! Oh, yes – I remember that: the foreign language requirement for doing a PhD in Literature! Or even just plain English (and me, loving the grammar end of things)! The programs I was looking at were requiring a ‘classical’ language, to boot (meaning, a dead one).Coffee. Yep – fuels so many things. Wow and I thought I was busy!! You really need the burst of energy to keep up with everything, though I’m sure you’ll do just fine!I’m trying to cut coffee cold ‘tofu’ right now, but I know Mondo would LOVE it if I made that for him! He loves coffee, doughnuts and cake. What a fabulous idea! I’ve always wanted to make doughnuts, but don’t have the patience to make them. 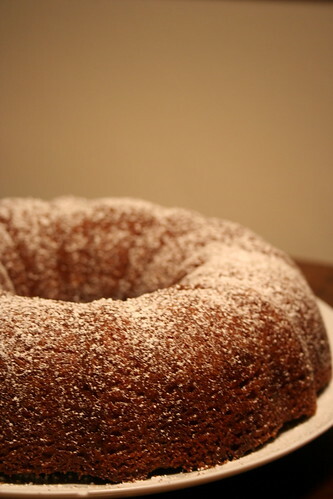 A bundt cake is the perfect idea. Yum!! That looks absolutely delicious. Send some my way!